There’s having lunch at your desk whilst working and then there’s having lunch. 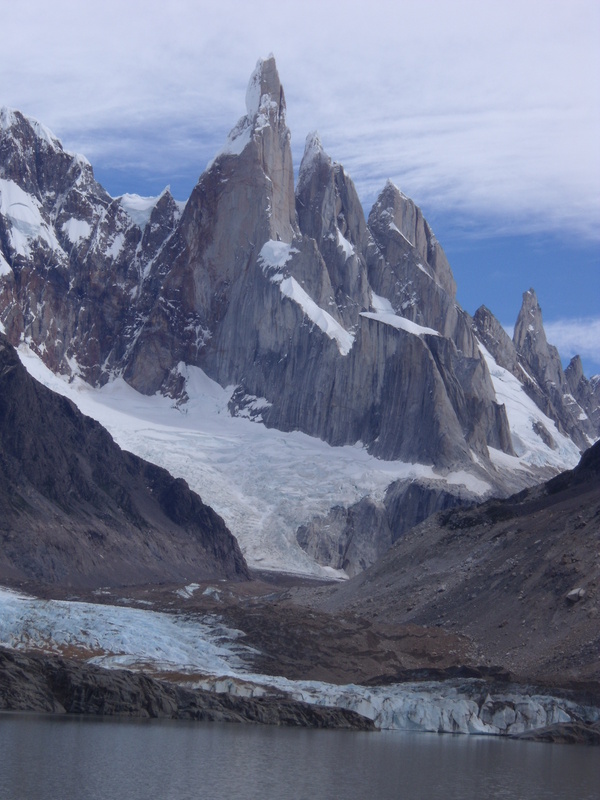 Below are two photos to show you the vistas upon which we’ve gazed during luncheon in El Chalten (Piedras Blancas glacier and the Cerro Torre mountain range). Once you’ve finished weeping with jealousy, I’ll make you feel a little better by telling you that the lunch was actually mackerel mayonnaise baps…. you can’t have everything I suppose. We’ve been exploring the great outdoors for a couple of weeks and it’s been splendid. 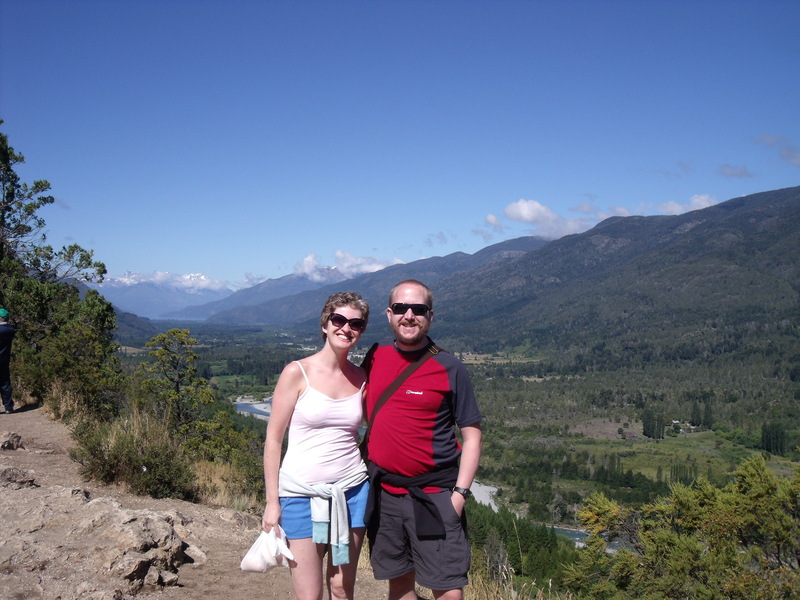 We started by heading to El Bolson after it had been recommended by a group of English folk we met in Buenos Aires. It’s a nice little town, quite sleepy and clearly existing to service the hikers and campers who come here, but doing so in a non-tawdry way. We stayed in a pleasant, family-run hostel complete with hose-wielding kids and three dogs who had clearly been created by committee (and who appeared to think that after dark was “barking time”). Also noteworthy was our room, which was decorated entirely in tangerine, and had curtains which only went 3/4 of the way up the window. This meant that our wake up call tended to be when we smelt our eyebrows singe with the rising sun. The people running the hostel couldn’t have been nicer – their friendliness even ran to the husband giving me my first Argentinian kiss (I’d read up on this, so knew what was coming and not to go for the lips), I’ve since had a further smooch with a rafting instructor who looked like Omid Djalili. The ladies are so far steering clear, maybe it’s the beard. We had some walking planned in El Bolson so headed up into the hills for a stroll on our first day, taking in incredible scenery at every turn: stunning valleys, lakes, mountains, waterfalls etc. 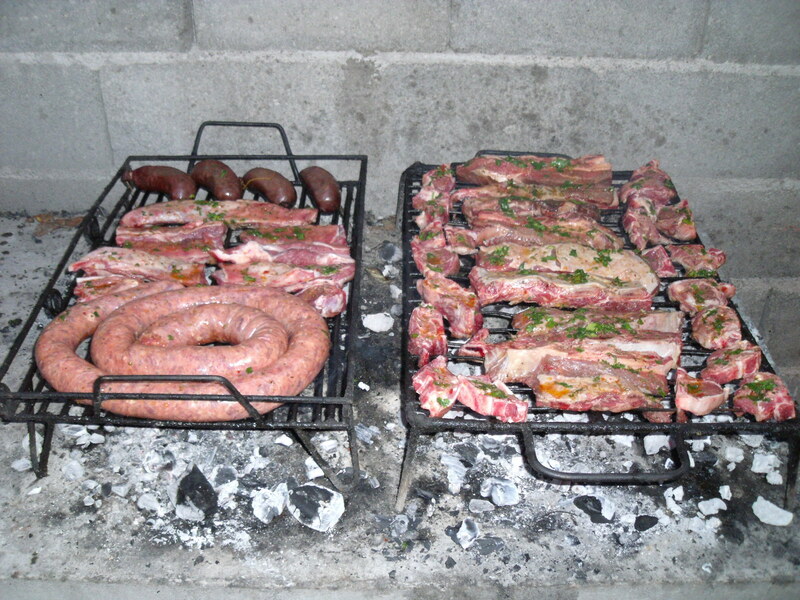 A six-hour jaunt made us feel fully deserving of the Argentinian BBQ the hostel owners prepared that night (delicious and plentiful with our first taste on this trip of lamb and some really excellent blood sausage!). We could even forgive the parsimonious provision of wine by the owners thanks to the generosity of the food portions, but perhaps not the stinginess of the other guests, none of whom followed our lead in going to the shop and getting a couple of extra bottles, whilst being quite happy to share ours of course (they were mostly English, but must have had some Scottish blood in them (!!)). We did a rafting trip on the second day, which wasn’t exactly thrills and spills, but was enjoyable nonetheless, in spite of Omid moonlighting as a geology teacher for long periods which frankly we hadn’t signed up for. 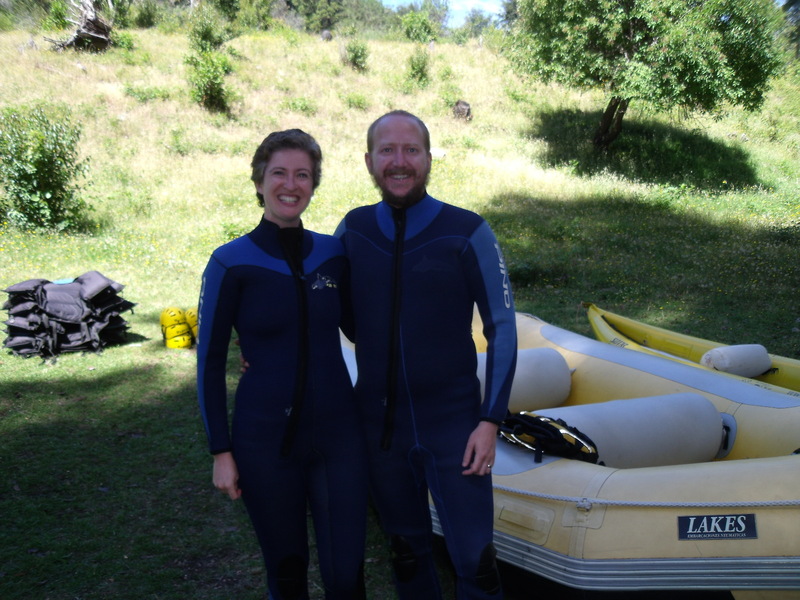 We also had a whale of a woman on board (it may surprise you to hear that she was also very loud), who insisted on getting over-excited at every bit of white water, however gentle, and paddling almost in direct opposition to the instructions given by the guide. We were disappointed that our prayers were not answered and she didn’t fall overboard and sink. Whilst the rafting wasn’t much of a rollercoaster, the snorkelling halfway through was an eye-opener. You have to remember that these are glacial rivers, so I’ve only just retrieved certain parts of my anatomy over a week later. Look out London, Milan and Paris! We also spent a lovely day at a crystal clear, bright blue lake (Lago Puelo), which although only 20km from El Bolson was noticeably colder, even when we got the blood pumping by making what turned out to be quite a lengthy climb to a viewing platform. 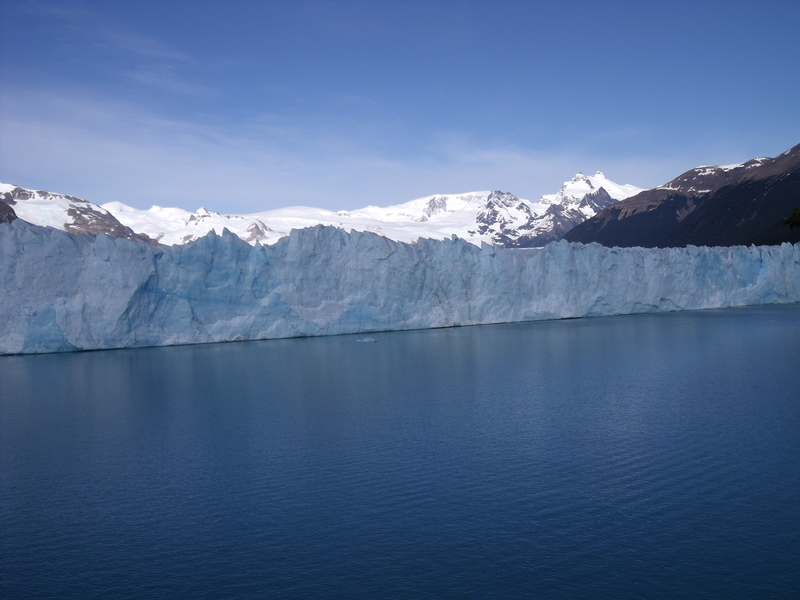 From El Bolson, we got yet another bus (our longest yet at 26 hours) to El Calafate, principally to see Glacier Perito Moreno. The bus journey was pretty hard work – we were served food about 10 minutes after getting on (interestingly a lot of the bus companies in Argentina have a fresh twist on the swiss roll, adding ham, cheese and mayo to the sweet sponge instead of the more traditional jam. When in Rome…. ), but that was the last we saw of either food or drink for the next 25 hours. 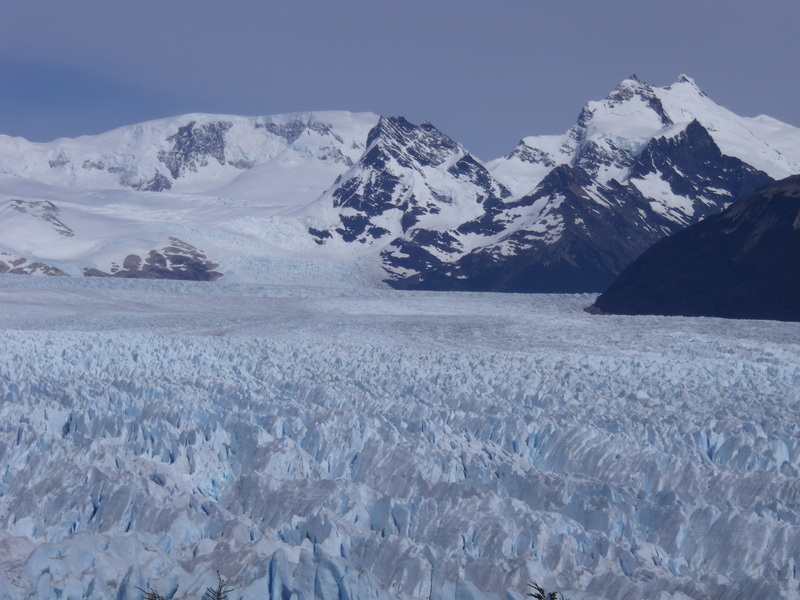 Thankfully, we made occasional stops, so we were alive upon arrival in El Calafate, no thanks to the Marga bus company. What we did have to endure, however, was an Australian couple in front us of canoodling and play-fighting like 15 year-olds through the entire journey (I can only assume that they were both unmarried and slightly retarded) thus making the (high quality) movie about Argentinian women’s hockey virtually unwatchable. 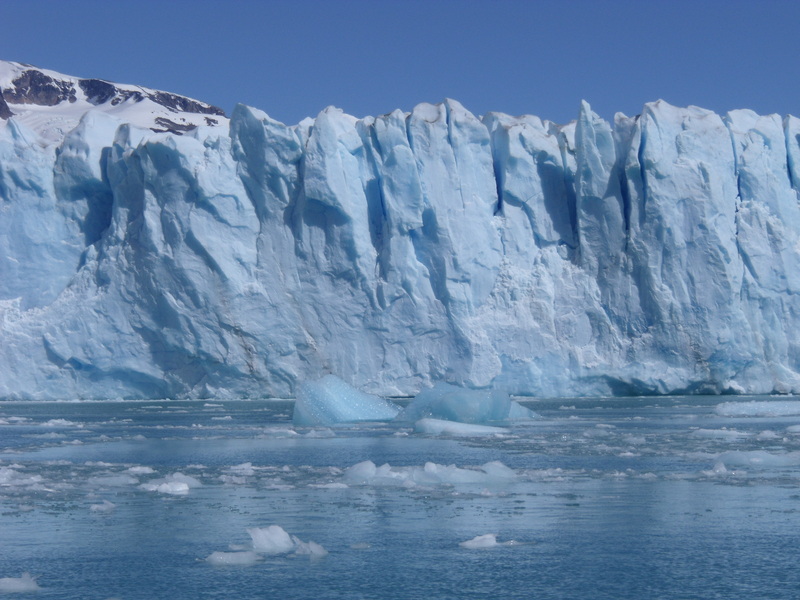 The glacier is truly impressive – huge, loud (creaks and groans), surprisingly blue and dangerous. 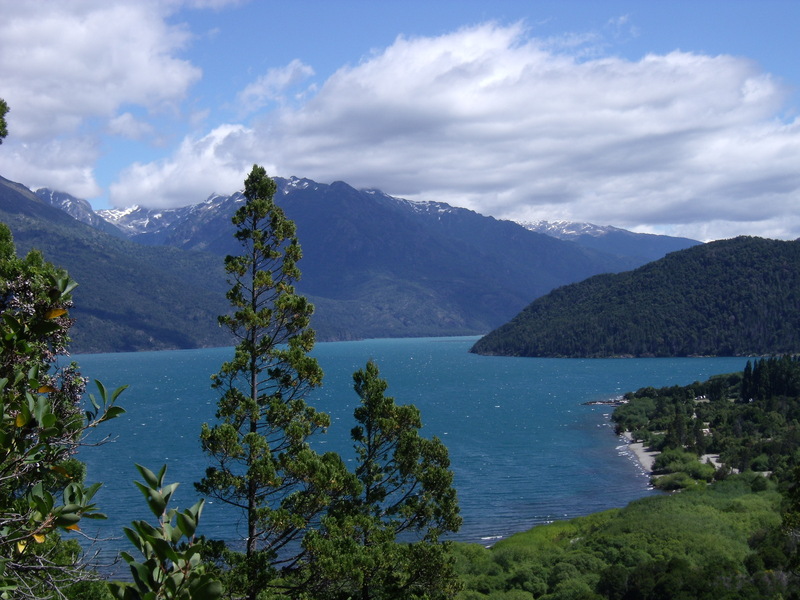 While we were there, we saw several huge sections “carve” off and plummet with a crash into Lago Argentina below. Whilst at the glacier we encountered a seemingly nice chap who quickly became the bane of our lives. He liked the sound of his own nasal, whiny, opinionated voice, seemed unable to hear anything we said (a bit like the Eric Idle character in the “Mr. Smoketoomuch”/travel agent Monty Python sketch), and described most things as “Spectacular…….. in every sense of the word” (how many senses are there exactly!!!). – Asking Jane to look after his bags while he had lunch 20 yards away. 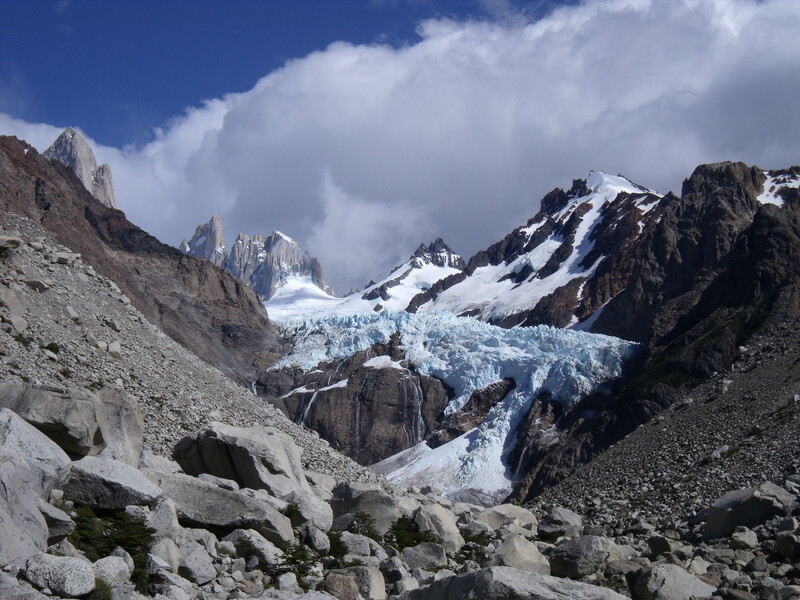 – Returning to the bus pick-up point 5 hours prior to departure, (thus spurning the best views of the glacier – but that’s OK because “he’s seen glaciers in Peru at 6000 metres”). – Booking two hostel rooms in El Chalten, just to be on the safe side (and planning not to inform the one he didn’t use – he did this in every town apparently). – Saying he disliked Argentina and couldn’t wait to leave (bugger off then you arse). 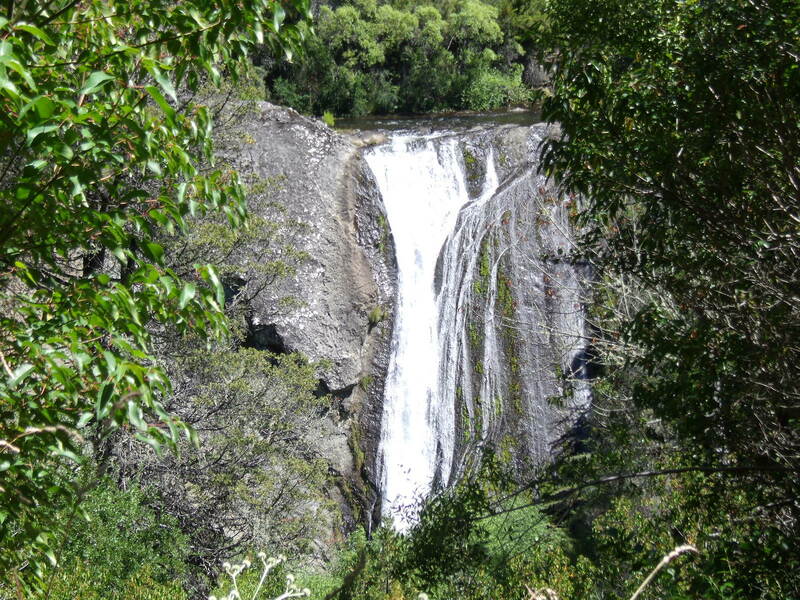 – Dismissing the possibility of visiting Igauçu Falls because he had been to Victoria Falls (surely this is akin to saying you wouldn’t bother with New York or Paris because you’d been to London). 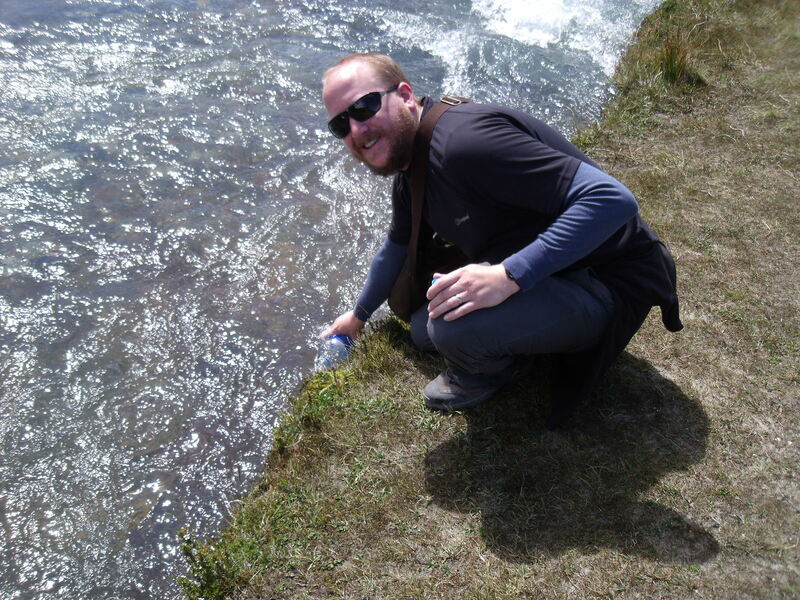 Naturally: he was in our hostel in El Calafate; when we headed to El Chalten he was the first person we saw; and he appeared in our hostel there twice on our first day even though he wasn’t staying or eating there. I’m sure he’s a harmless pest, but just in case we’re found murdered in our beds, his name is Steve and he’s from Peckham. (You won’t believe this, but he’s just tapped Jane on the shoulder in this very internet place to say hello and I quote “You look scared” (I’m not joking)). 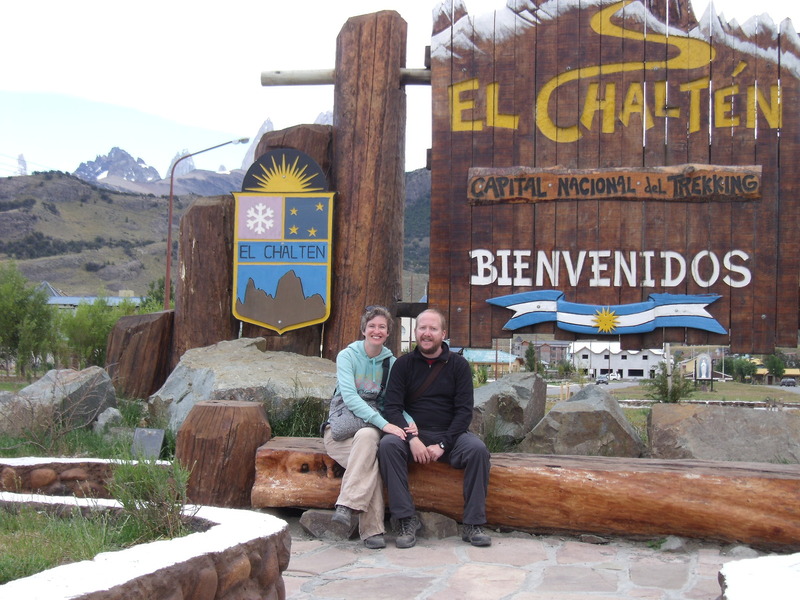 I’ve already mentioned El Chalten, which we headed for next. 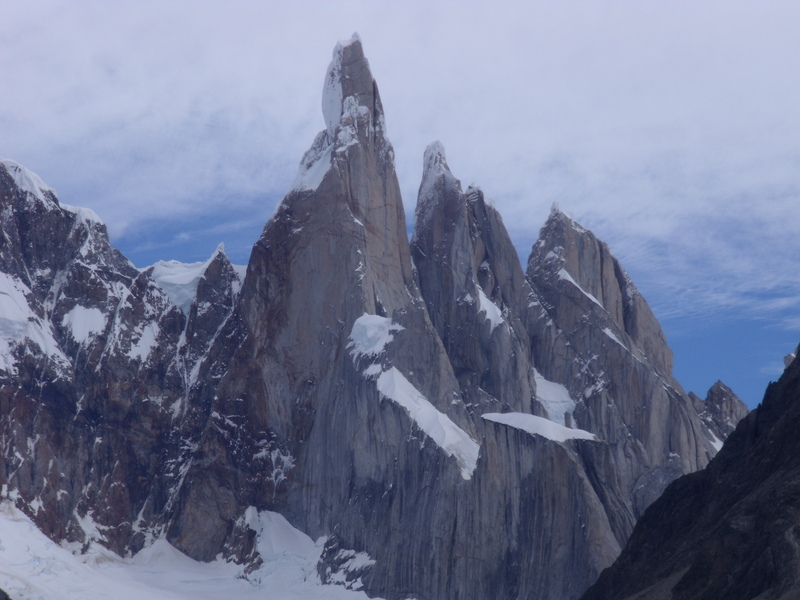 It’s a very small place, much of which is still under construction, a town servicing the mountain ranges containing mount Fitz Roy and Cerro Torre. 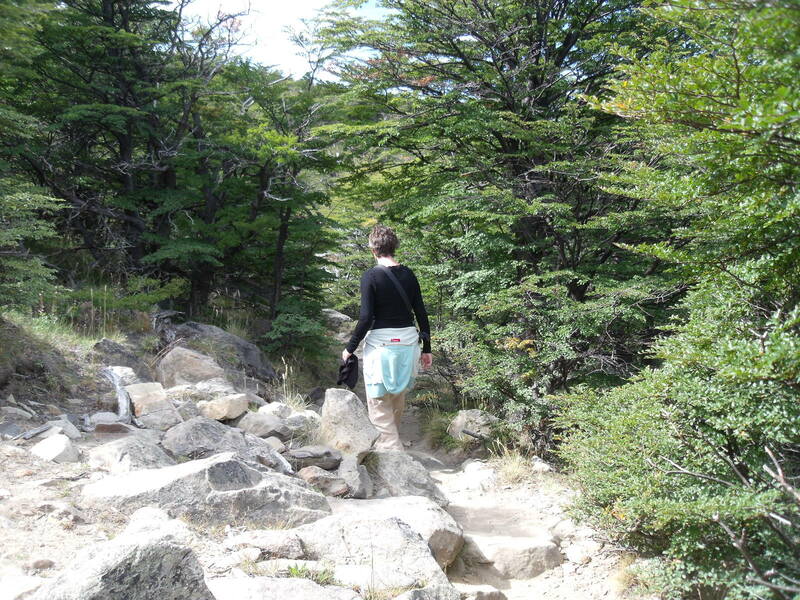 We were to get some hiking mileage under our belts here (to my slight apprehension). 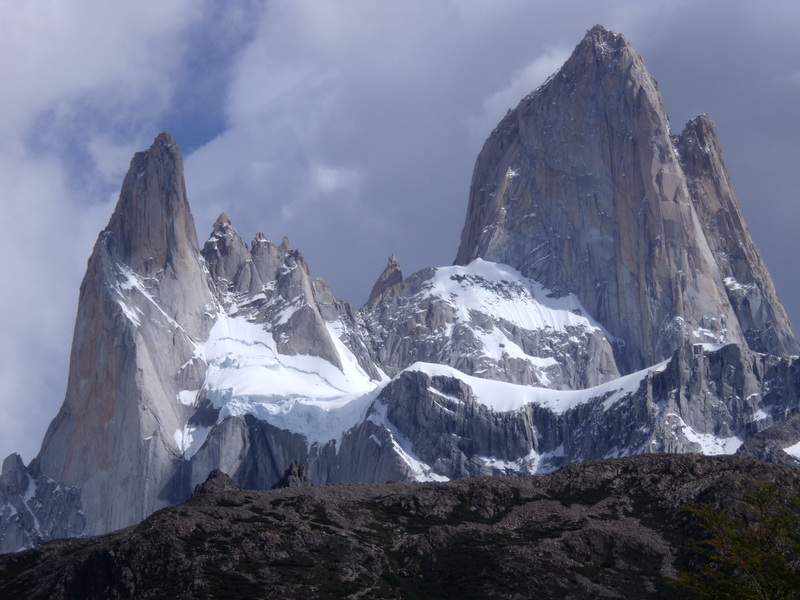 Two days hiking carried us 49km (just over 30 miles in old money) in total, on pretty ropy trails at times, and took in some fantastic mountain scenery, including great views of Fitz Roy, Torre and other mountains in the jagged, toothlike ranges. Whilst it will surprise those of you who know us to hear that we didn’t keel over during these two days, it was hard work and the legs didn’t like it. The effort was definitely worth it though. Whilst we didn’t collapse, we did both make a comedy fall – me when leaping from rock to rock like a mountain goat and Jane on the final downhill stretch while recalling/berating a bloke who earlier had been giving his girlfriend instructions on how best to walk down a slope (“keep your weight back”). Oh, the irony! We also flew in the face of everything our Mums told us as children, by filling our water bottles directly from streams, mavericks that we are (fear not, the park rangers had told us it was safe and there have been no ill effects so far). The only unpleasant part of these walks apart from the uphill sections was the attacking flies – these beasts meant business. It seemed that a single fly would take each of us on, repeatedly flying at pace directly at our heads and faces for upwards of 10 minutes at a time, with the effect that we walked large sections of the trail with arms flailing around our heads like nutters. Jane fashioned a fly swatting device out of her spare t-shirt so she didn’t look ridiculous at all. Anyway, we’re now back in El Calafate awaiting a 22 hour bus to Puerto Madryn on the Atlantic coast. Other things to update you on are that we’re tightening our belts and have started self-catering, which is saving us a lot of money and Jane is working wonders in unpleasant conditions (at one point the entire teenage population of France were in a kitchen big enough for about 3 people (although this did give Jane the opportunity to hear a Frenchman say “Ooh la la” with no hint of sarcasm)), but I’m missing eating slabs of steak and chips until they come out of my ears. We’ve also encountered a lot more traveller-types in these parts, recognisable by one or more of the following classic items/fashions: A guitar; dreadlocks; woolly hat (worn with shorts and t-shirt! ); bongos; piercings; beads; bracelets; cloth bags; headscarves; tattoos; an ability to sit on the floor anywhere; beards (although the gents with beards actually look pretty good I’m told!). Happily a lot of these have turned out to be actually Argentinians, so it’s not just a British gap years t##ts who feel like they have to dress the part. We are so far resisting but it’s only a matter of time until we succomb. 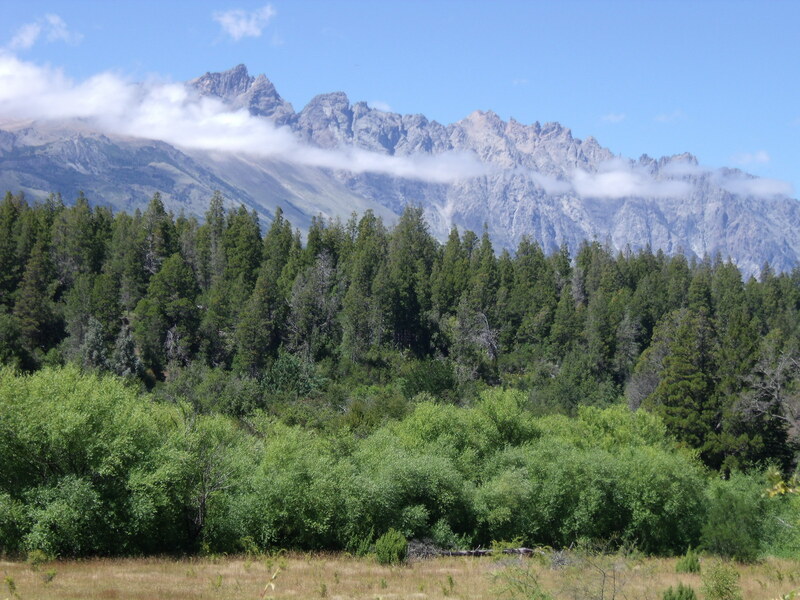 We have also noticed the disparity between prices for national parks between us and the Argentinean nationals. 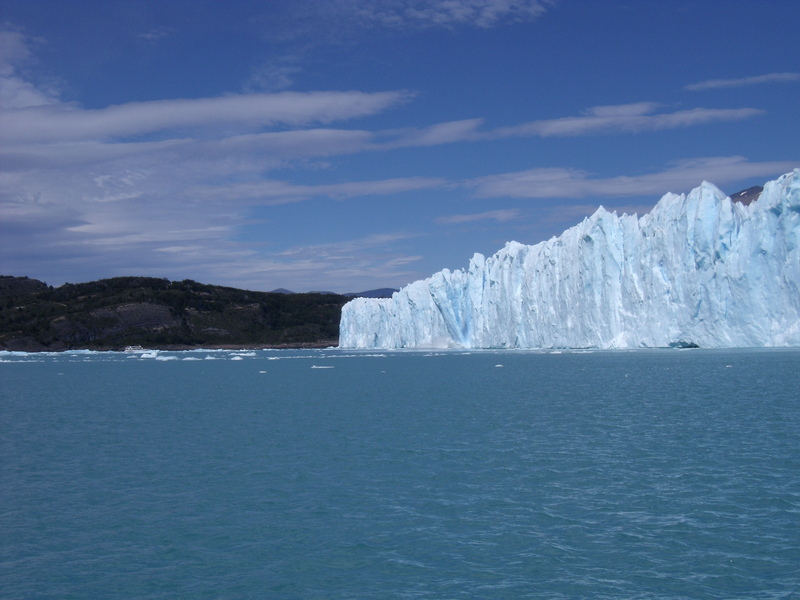 As an example, we paid 80 pesos for the Perito Moreno park, but the locals only stumped up 8 pesos! I beseach any of you who run a business, or know anyone who does, to inflate your prices to ridiculous heights for any non-Brits. That’ll learn ’em. I actually drafted this yesterday and we’re in Puerto Madryn now (no sign of Steve yet), so tomorrow I return to my roots by visiting my elephant seal brethren. At least their farting will mask my ever worsening stench. Cheers to your travel! My parents live 10 km from El Bolson, and I have a picture from every year I visited them at the same place/vista you took one (above), so cool. 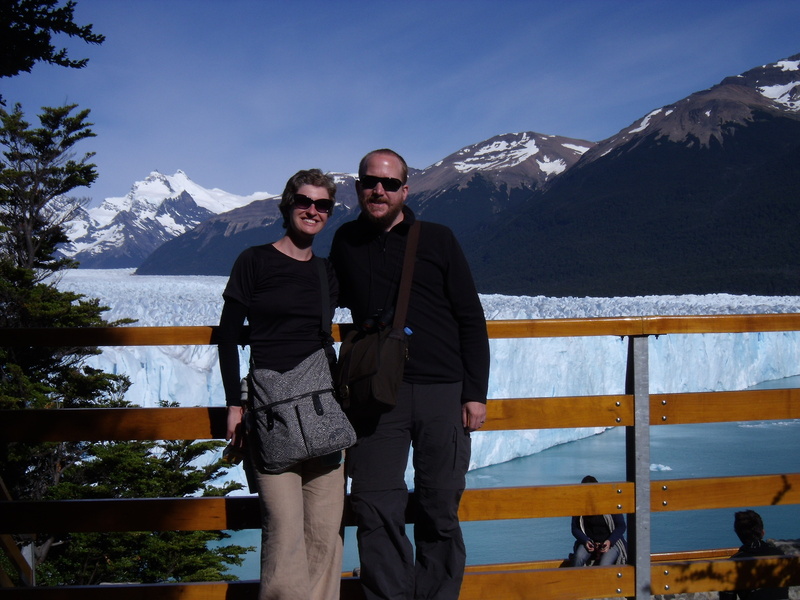 My husband and I are planning an extended trip next year and want to see glaciers. I stumbled upon your blog while browsing for transportation options from El Bolson. If you can please share your experience, I would really appreciate it. Would you recommend taking a bus, or you would rather pay more for the air fare? 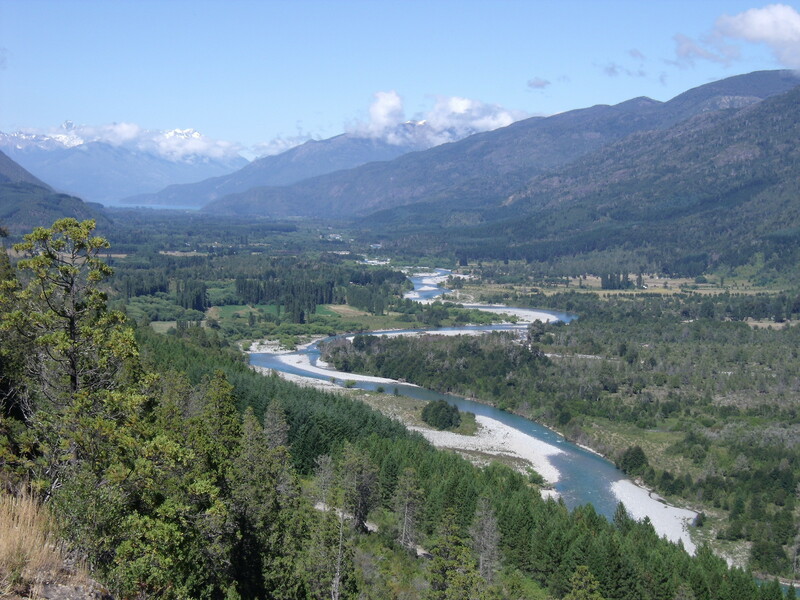 What are the “must see” in the Glacier Park and what can be skipped? …. one more… how many days should we go for?